The launch event was co-hosted by the United Nations Framework Convention on Climate Change (UNFCCC) and GWP. Here is a two-page summary about the publication. 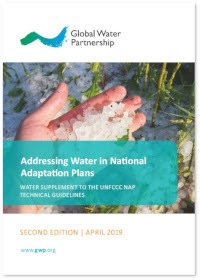 "Addressing Water in National Adaptation Plans – Water Supplement to the UNFCCC NAP Technical Guidelines". Water is the most-cited pathway through which countries experience climate impac ts, and also the most-often prioritised sector through which countries seek to build resilience in their economies, their populations’ livelihoods, and their natural ecosystems, as indicated in a 2016 UNFCCC study of 162 Nationally Determined Contributions. Follow us on Twitter and spread these important messages!